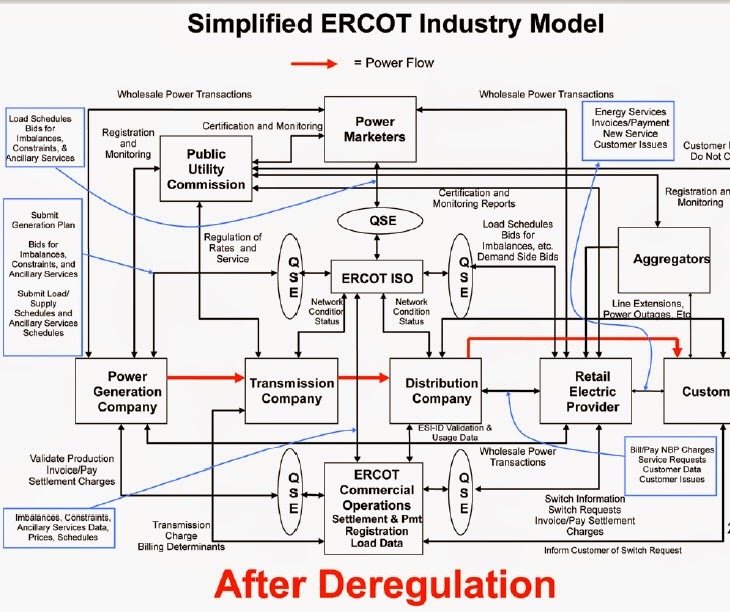 ERCOT implemented nodal pricing for the Texas wholesale market in 2010. The project once projected to cost less than $76.3 million ended up costing more than $500 million. Electricity deregulation in Texas was the result of the coming into force of Texas Senate Bill 7 on January 1, 2002. 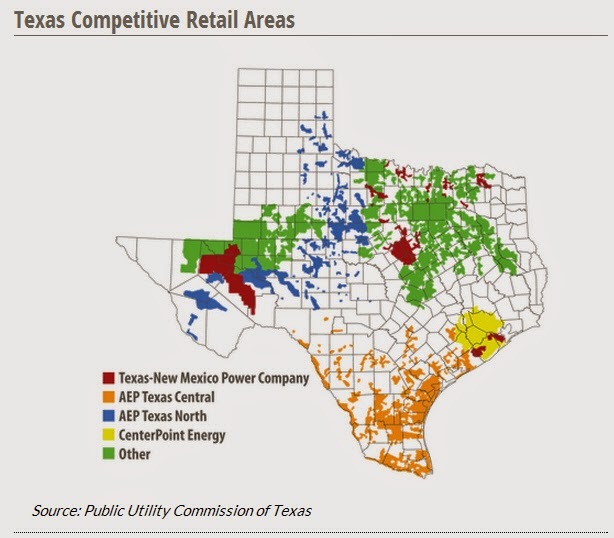 As a result, 85% of Texas power consumers (those served by a company not owned by a municipality or a utility cooperative) can choose their electricity service from a variety of "retail electric providers" (REPs), including the incumbent utility. The incumbent utility in the area still owns and maintains the local power lines (and is the company to call in the event of a power outage) and is not subject to deregulation. Houston Lighting & Power (HL&P), for example, split into three entities: NRG Energy ended up in the generator role, CenterPoint took over the transmission system, and Reliant inherited the customer base. In Dallas, TXU made a similar split, although all three companies—the generator, Luminant; the transmission company, Oncor; and the retailer, TXU—operate under the umbrella of Energy Future Holdings. Initally, retail prices increased more than the national average in part because Lawmakers had tied the wholesale price of electricity to natural gas (which they thought would remain cheap) because many of the power plants in the state used it for fuel. Then the average price that utilities paid for gas surged from about $3.10 per thousand cubic feet to almost $12, pushing electric bills well above the national average. Only recently did electricity prices drop significantly, as fracking unleashed a glut of natural gas. Since 2002, approximately 85% of commercial and industrial consumers have switched power providers at least once. Approximately 40% of residential consumers in deregulated areas have switched from the former incumbent provider to a competitive REP.
Texas has electricity consumption of $24 billion a year, the highest among the U.S. states. Its annual consumption is comparable to that of Great Britain and Spain, and if the state were an independent nation, its electricity market would be the 11th largest in the world. 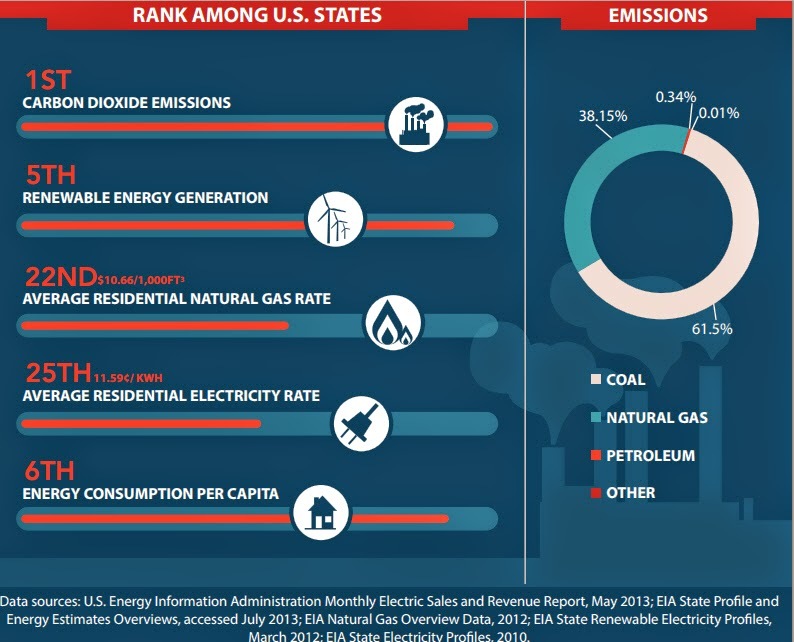 Texas produces the most wind electricity in the U.S., but also has the highest Carbon Dioxide Emissions of any state. As of 2012, Texas residential electricity rates ranked 31st in the United States and average monthly residential electric bills in Texas were the 5th highest in the nation. Aggregator - A legal entities that join two or more customers to purchase electricity at reduced rates. Broker - A legal entities that work with multiple Retail Electric Providers in order to shop the market for a competitive rate for their clients. EMC - Excess Mitigation Credits - Represented the value of refunds that would have gone back to ratepayers had the Legislature adopted HB 2107 (the start of this section). But instead of flowing back to ratepayers, the PUC sent the money (through an indirect process) to electric retailers. These retailers had never su"ered from the stranded cost overcharges, and yet they would now bene#t from them. In many cases, the retailers were #nancially a$liated with the companies that were ordered to pay the EMCs. Under SB 7, retailers a$liated with the state’s traditional utilities charged the Price To Beat rate. Setting aside adjustments for fuel costs, the Price To Beat was a fixed rate. Customers on the Price To Beat paid that rate and only that rate — no more, no less — which meant they could not receive EMCs. But the Price To Beat retailers who served them were receiving almost all of the excess mitigation credits because these retailers then controlled 85 to 95 percent of the residential market. Said another way: the Price To Beat retailers took the EMCs but were prohibited by rule from passing along the bene#t to their residential customers. TEPA - The Energy Professional Association - A 501 (c)(6) organization composed of Aggregators, Brokers, and Consultants (A/B/Cs), Retail Energy Providers (REPs) and affiliate members, TEPA specializes in providing market knowledge to help consumers make the best energy procurement choices and to uphold the integrity of deregulated retail energy markets across the country. TEPA was largely credited with the early and high rate at which residential, commercial and industrial consumers in Texas switched to a competitive REP.
VMP - Voluntary Mitigation Plans - These proposals are designed by the generation companies themselves and are meant to describe fair business practices. They typically include descriptions of bidding behaviors and other rules that, if followed, should signal to regulators that the generation company is playing by the rules. As long as the companies do not deviate from the actions they describe in the plans, the companies remain protected against prosecution for anti-competitive behavior. 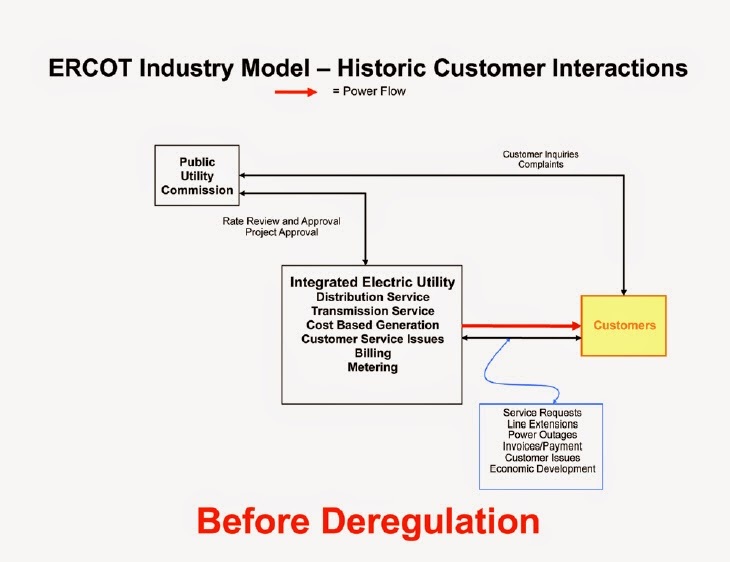 Back in 1999, the Texas Legislature thought that by passing a deregulation law, they could get rid of electric company monopolies and reduce government control of electricity rates. The idea was that multiple Retail Electricity Providers (REPs) would create competition, and competition would drive energy prices dow. Customer Service - If consumers don't like their REP, they can choose another one. 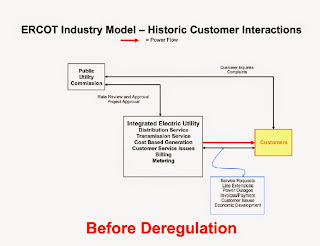 However, complaints from electricity customers have been greater during deregulation, as compared to those !led with the Public Utility Commission prior to deregulation. On the other hand, customer complaints filed a tthe Public Utility Commission have declined in recent years, after peaking in 2003 and 2009. Bankruptcy Protection - Here's the story from Loren Stefffy in the Texas Monthly, for the beginning of this story, see below 5. Risks/Issues - Rise of the Oligarchs. Ironically, the bankruptcy of Energy Future Holdings (nee TXU) could bring into focus one of the few bright spots of deregulation: consumers are no longer getting stuck with the bills for utilities’ financial follies. Many residents of El Paso remember how, in 1992—well before the onset of the deregulation era—they were forced to fund about $1.2 billion of El Paso Electric’s bankruptcy reorganization. Today, by contrast, it is EFH’s bondholders who will bear the brunt of the company’s failure. What’s more, if Luminant’s power plants are sold off piecemeal in bankruptcy, it may improve competition on the generating side of the market by creating more generator companies. The billionaires’ bad bet may turn into consumers’ best hope for reversing a decade of deregulation’s failures. Favorable Market for Renewables - Texas' first "renewable portfolio standard" — or requirement that the state's utilities get a certain amount of their power from renewable energy like wind — was signed into law in 1999, as part of the same legislation that deregulated the electric market.The profitable and growing Texas electricity market has drawn considerable investment by wind-turbine companies. In July 2006, Texas surpassed California in wind energy production. Higher Cost to Consumers - According to a 2014 report by the Texas Coalition for Affordable Power (TCAP), "deregulation cost Texans about $22 billion from 2002 to 2012. And residents in the deregulated market pay prices that are considerably higher than those who live in parts of the state that are still regulated. For example, TCAP found that the average consumer living in one of the areas that opted out of deregulation, such as Austin and San Antonio, paid $288 less in 2012 than consumers in the deregulated areas. While prices to customers increased 43% from 2002 to 2004, the costs of inputs rose faster, by 63%, showing that not all increases have been borne by consumers. Based on my research so far, it seems like these higher prices were more due to a bad bet by the Texas Legislature basing wholesale prices on the price of natural gas which skyrocketed in the early 2000's, only to plummet in recent years due to fracking than to the deregulation of the retail market. However, the Texas Coalition for Affordable Power argues that high prices in Texas are not simply a function of the market’s reliance on natural gas but rather a function of how the market relies on natural gas. Under ERCOT rules all power accepted to meet demand in the spot market is paid for at the price of the most expensive power accepted to meet that demand. This becomes the “clearing price” on the wholesale spot market — and in most cases, it’s a gas plant that sets it. So, natural gas prices help set the price for all spot energy in ERCOT, which then ripples throughout the entire wholesale market, and in 2007 increased residential bills. By contrast, regulated investor-owned utilities are required to charge rates that reflect the actual cost to generate power, based on the average of all of the fuel used in the utility’s generation $eet. This means that regulated retail rates include a fuel cost that is a blend of costs associated with several kinds of fuel, ranging from stable, low-priced lignite or coal, coal or nuclear generation to high-priced gas. Stranded Costs - Deregulation-related charges known as stranded costs will add nearly $7 billion to consumer bills. Texans will continue to pay these charges for years to come. Stranded costs represent the value of expenditures made by utilities in a regulated environment that would be recoverable from ratepayers over time under regulation but which might be unrecoverable in a competitive environment. The theory is that if generation assets become uneconomical burdens under deregulation, then ratepayers owe utilities the lost value of those assets. Stranded costs are calculated by considering the difference under deregulation between the book value of a utility’s generation assets like coal, lignite and nuclear generation plants and the market value of those assets. While the book value remains relatively constant (changing annually with depreciation accounting entries) during the transition to deregulation, market value changes daily. The calculation of market value is tied to natural gas commodity prices, which can directly impact the value of a utility’s entire generation fleet. When natural gas commodity prices are low — as they were in the years preceding deregulation — the cost to generate power using natural gas plants is also low compared to plants that use coal, lignite or nuclear fuel. That means that low natural gas commodity prices would tend to make a utility’s standard fleet of coal, lignite and nuclear plants relatively less valuable in the market — and therefore increase the value of the utility’s stranded costs. Evidence suggests that supposedly uneconomic plants were woefully undervalued. For instance, in determining the stranded cost pay-out to Houston’s CenterPoint, the PUC considered a partial stock sale by the company that established the value of its generating assets at $3.65 billion. But days after the PUC calculated CenterPoint’s stranded costs, the company’s equity owners resold those same generating assets for $8.3 billion. Regulatory Complexity - Breaking up the old monopolies created a more complicated system for the state to oversee. 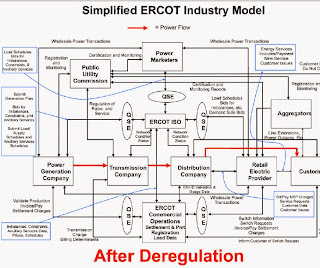 The wholesale market that the generators participate in is managed by the nonprofit ERCOT, which is itself overseen by the Public Utility Commission and the Legislature. The transmission companies are still directly regulated by the PUC, which must approve the rates they charge retailers. The PUC also oversees more than one hundred retailers, who compete against one another by offering customers a dizzying array of contract terms and rates. Texas has a hybrid of regulated and deregulated markets, that requires more government involvement and bureaucracy than the old monopoly system. Reliability - There have been two statewide rolling blackouts in four years under the new system,and there were at least nine reliability emergencies during 2011 alone. By contrast, ERCOT ordered statewide rolling blackouts only once in 30-plus years before deregulation. From what I've learned thus far, reliability in Texas is still OK. Any reduction in reserves is due to Texas' growth coupled with investment in new generation that falls short of demand growth. One way of looking at it, is that fewer reserves = greater economic efficiency of the system. Lack of Capacity Thwarts Competition - In theory, generators compete, but in practice the competition doesn’t mean much: with the state too often on the verge of rolling blackouts, there’s no market efficiency. Every plant, no matter how old, dirty, or expensive, is needed. So none of them are actually competing for anything. For a while, generating electricity was where the money was, and no one smelled the potential to make money more than Fort Worth billionaire David Bonderman. After HL&P split, the law required the sale of HL&P’s power plants, which was done at fire-sale prices. Enter Bonderman, who snapped up the plants for about $3.7 billion in 2004. A year later, he sold them for $5.8 billion. Not bad for a year’s work. By 2007, Bonderman was angling for an encore. Teaming up with the New York equity firm Kohlberg Kravis Roberts & Company and the investment banking giant Goldman Sachs, he put together $45 billion to buy TXU in one of the largest leveraged buyouts in history. It turned out to be one of the biggest leveraged flops in history. Today the company lingers on the brink of bankruptcy, and its investors stand to lose billions. The story of how the state’s biggest utility became its biggest economic basket case is the stuff of Texas legend, reminiscent of Boone Pickens’s wrong-way bet on natural gas and the Hunt brothers’ attempt to corner the silver market. 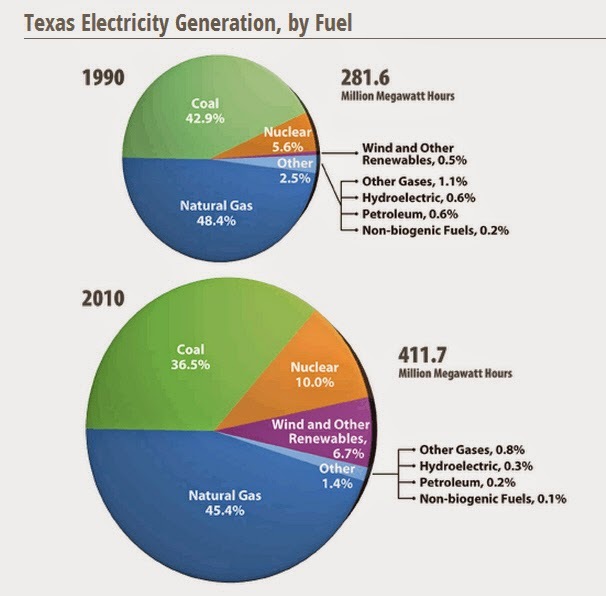 Most of TXU’s power came from coal-fired plants, and coal at the time was much cheaper than natural gas, which set the price in the wholesale market. That meant TXU could generate power on the cheap, then sell it onto the grid for much more. It was essentially a guaranteed profit that could easily be used to pay off the $44 billion in debt that Bonderman and his billionaire buddies piled on top of the company, which they renamed Energy Future Holdings. Then fracking caused the price of natural gas to plunge, wiping out the profit guarantee. With thinner profit margins, the debt from the buyout became a crushing burden, and by last year the future for EFH looked bleak. In October it came within a financial whisker of filing for bankruptcy before dodging a Halloween deadline by making a $270 million debt payment. That kept creditors at bay, but they are still haggling over plans to carve up the company through a “prepackaged” bankruptcy, the corporate equivalent of a quickie divorce. Market Uncertainty Leads to Lack of Investment - With gas prices so low and retail contracts sold mostly on an annual basis, generators can’t get financing to pay for new construction because they can’t predict their revenue stream more than a year or two out. “There’s no method for compensating anyone in the market for building new generation. Texas had the highest generation reserve margins in the nation prior to the implementation of the deregulation law. Texas now has among the lowest. Fragmented Demand Response - Currently, the incentives to reduce electricity use during periods of peak use, aren’t strong enough and they aren’t offered to residential customers. Wholesale Market Manipulation - Generators can withhold power and drive up prices. the Texas Legislature adopted a helpful reform in 2011. Texas maintains the nation’s highest wholesale price cap for energy, and that offer cap will continue to increase through at least 2015. Technical Barriers - The nature of electric power complicates deregulating electric markets. Electricity — unlike most tradeable commodities — cannot be stored. This means that in a deregulated system, consumers are captive to volatile price swings. Because electricity is essential to the public welfare, dips in reliability or increases in prices can cause serious hardships and medical problems. Spot Market Management - Under the ERCOT-managed spot market, the cost of the highest acceptable bid for power dictates the price to all successful bidders. For example, ERCOT might receive scores of bids ranging from $50 per megawatt-hour to $1,000 per megawatt-hour. If the grid operator needs 100 percent of that power to meet demand, then all bidders get the top price, or $1,000 per megawatt-hour — even those who submit bids offering to accept payment of $50 per megawatt-hour. What’s the right balance between system reliability and cost? What can be done to reduce confusion in the retail electricity market? What reforms would help guard the deregulated market against anti-competitive abuse? How can policymakers guard against waste and inefficiency at the organization that oversees the power grid? Powertochoose.org - Texas retail electricity comparison tool. The tool now has a complaint scorecard and complaint history. An April 2014 search of a Houston zip code resulted in 268 plans ranging from 7.6 cents per KWh at the 1,000 KWh level to 14.76 cents. Most plans had a daily fixed charge. Unlike California's rate structure, the more you use, the less you may per unit. There were nine time of use plans, all but two offering free Saturdays or Sundays.